Jamie Jo is from a small town called Mt. Holly located in New Jersey. She grew up in midtown and is a local city slicker. She comes from a long line of artist and has been engulfed within the local art community of Kansas City for 11 plus years. She has shown locally at The Leedy Voulkos , Carters Art Center, and Mattie Rhodes. She is also a current member of Southside Soul Brigade which is a crew with in the Kansas City Mardigras Scene. She sells her art in galleries as well as to private collectors. She enjoys painting because of the creative release she is able to achieve while working with her hands to produce something beautiful. She focuses on capturing the essence of an individuals soul while painting their portraits as well as the cause and effect color theory places on images. Jamie Jo likes her whiskey!!! 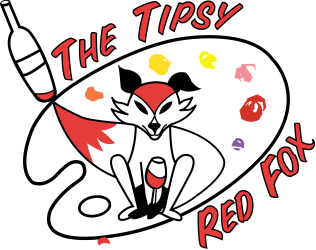 You will be in good company while you drink and paint at The Tipsy Red Fox.